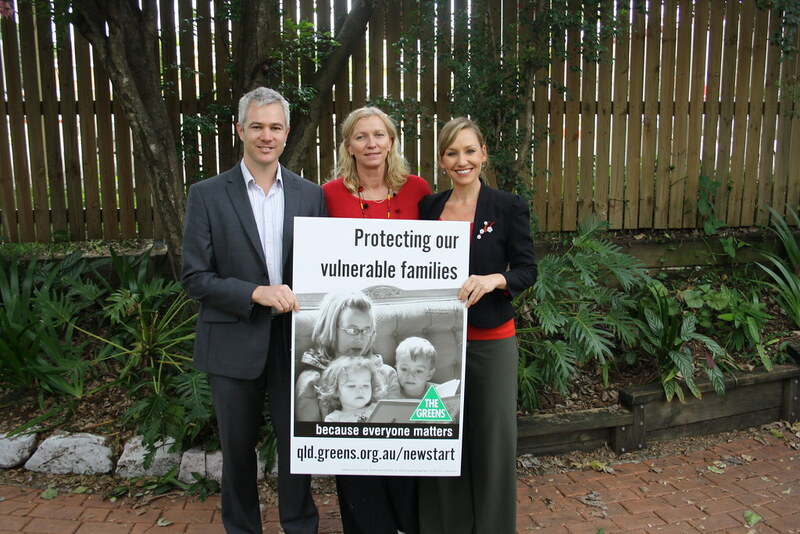 The Queensland Greens, single parents and charity groups today joined forces for an increase to Newstart in Brisbane, as a new Salvation Army survey showed families on Newstart are under more pressure than ever before. “The survey of thousands of Salvation Army clients released today showed single parents are under more pressure than ever before, with more than half reporting they’ve gone without meals themselves at times so they could feed their children,” Australian Greens Senator for Queensland Larissa Waters said. “Labor’s decision to shift 84,000 single parents on to the meagre Newstart payment, which is below the poverty line, is obviously taking its toll. “Tony Abbott, who is in Brisbane today, is prepared to put single parents on Newstart under even more pressure by taking even more money from them. “Only the Greens have costed legislation that would effectively and responsibly deliver an increase of $50 per week to the Newstart Allowance and an additional supplement payment of $40 per week for single parents on Newstart,” Senator Waters said. Australian Greens Lead Senate Candidate for Queensland Adam Stone vowed to make the Newstart Allowance an election issue in Queensland in the wake of the budget’s failure to deliver for the poor. “It is simply cruel to keep tens of thousands of Queenslanders so poor that they cannot meaningfully seek work and to cut payments to single parents when we knew they were already struggling. “The Salvation Army survey shows many children are missing out on out of school activities, annual dental checkups and new or up-to-date school books and uniforms because parents simply cannot afford these necessities. “The Queensland Greens have already begun campaigning for an increase to the Newstart Allowance and more support for single parents by launching a petition and holding stalls across the state,” Mr Stone said.